FBI agent Drury Ryland may have a checkered past with Caitlyn Denson, but when she shows up at his family ranch with a newborn and a killer on her trail, he'll lay the past aside and put his life on the line. Navy SEAL sniper Austin Foley knows the tough and brilliant Sophia Grant may hold the key to thwarting a terrorist plot—but can he break down her barriers before disaster strikes? Sheik Emir Al-Nassar turns to expert profiler Kate Gelinsky when tragedy again targets his family, but as the investigation leads them through Morocco, the danger and passion turn explosive. 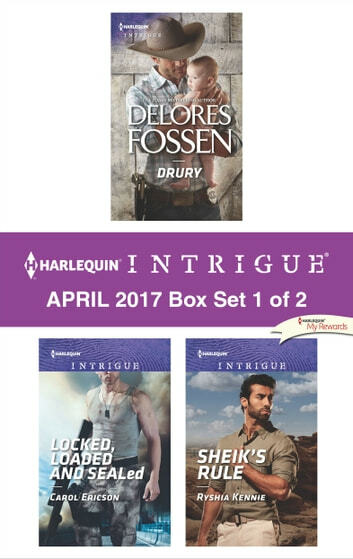 Look for Harlequin Intrigue's April 2017 Box Set 2 of 2, filled with even more edge-of-your seat romantic suspense!